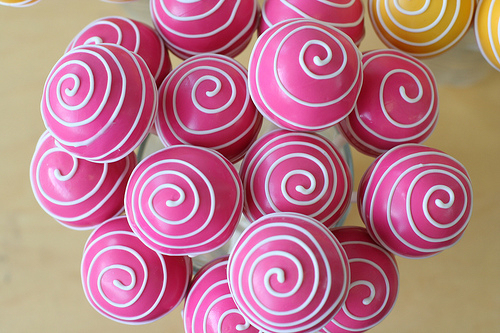 Do you remember the first time you saw some cake pops (or cake balls to some)? I’m sure your reaction was similar to mine – How adorable, followed by, Why didn’t I think of that? It’s become a craze over the last few years and the creativity with some of them is masterful. On Amazon alone, there are pages of ideas, videos, cook books and products all for Cake Pops. It’s something to see. I mean, to take little bits of smushed up cake, mix it with frosting, and then mold into works of art is ingenious. Not only that, but it’s a perfect way to use those left over pieces of cake and turn them into something entirely new. 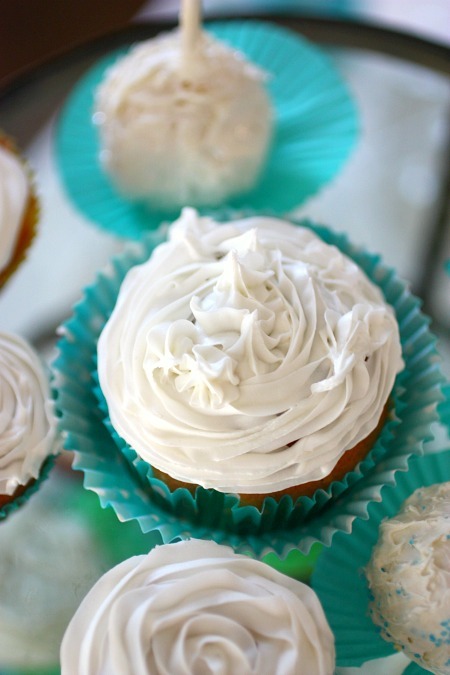 This is the up close and personal look at our not so perfect frosting application, which is the trickiest part, but truly, not one person really notices. 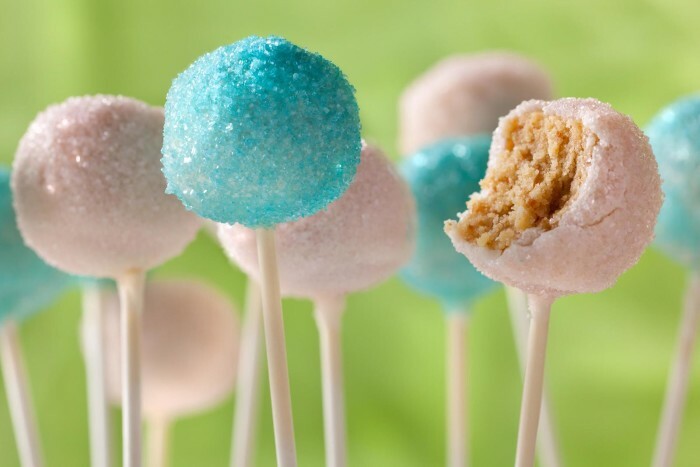 That’s the beauty of these simple party cake pops. Give yourself freedom!! 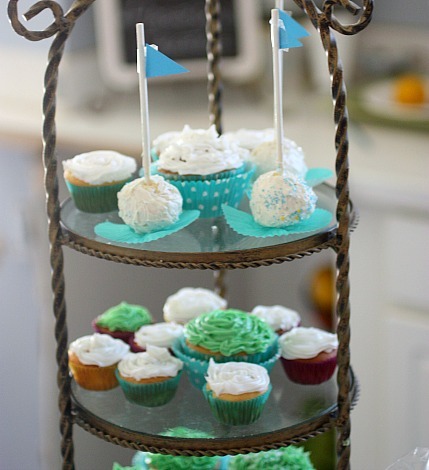 They are so many cute ways to display them and most likely depends on your theme. When I’m in a huge hurry, I save additional time by using melted store bought frosting to dip them in instead of the candy coating which is recommended. Again, it depends on how sheer you want the coating. 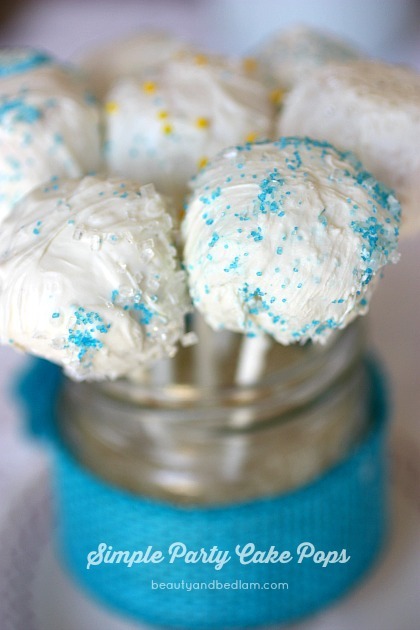 Summary: Simple Cake Pops: the perfect way to add a festive touch to any party. Make homemade cake or store bought cake and once it’s cooled completely, crumble into large bowl. Roll mixture into 1 1/2 inch balls and place on cookie sheet covered with wax or parchment paper. 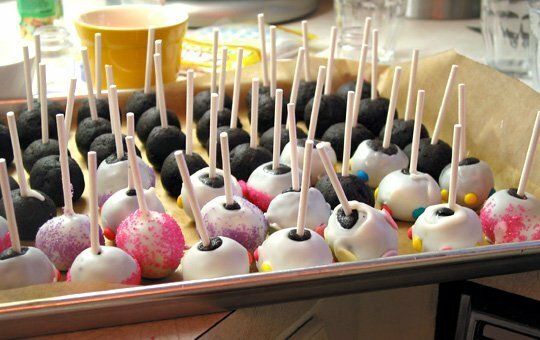 Once firm, insert the cake ball into the melted frosting or candy coating by holding the lollipop stick and rotate until covered. 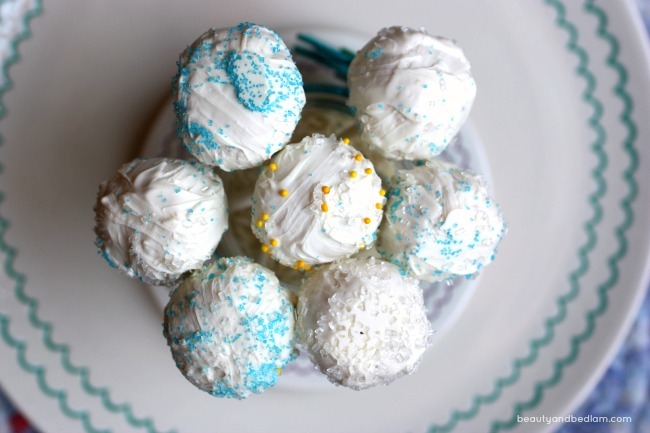 Only take a few cake balls out of freezer at a time since they’re easier to work with cold. Once covered with coating, softly tap and rotate until the excess coating falls off and even coating occurs (here’s where it doesn’t have to be perfect). Immediately dip into sugar coating or add sprinkles, dots etc and let harden. 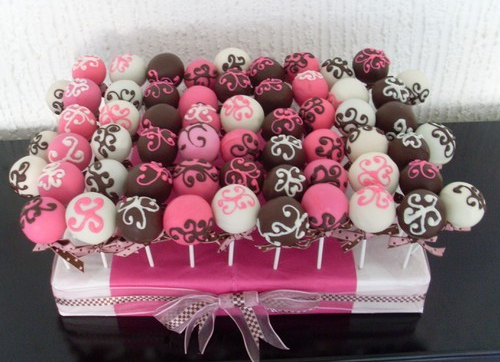 When finished with the cake pops, do not store in fridge or the coating will not hold up. Store in airtight container or you can make these ahead of time and freeze like shown here from the Kitchn. 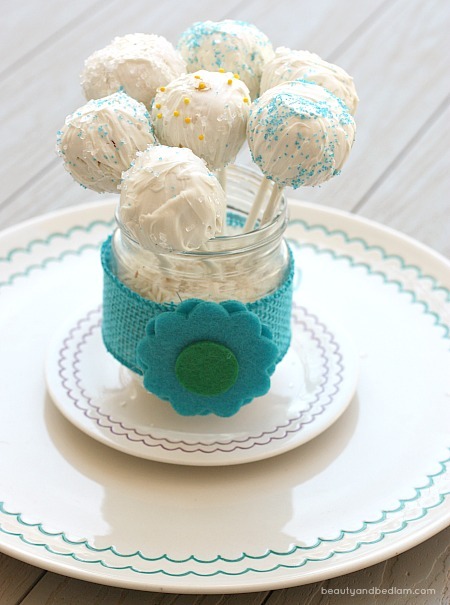 Don’t you love the elegant simplicity of Chow’s sugar coated cake pops? Someone shared these without a source and I so wish I could tell you where to find them because I love the elegance of the simple swirl. 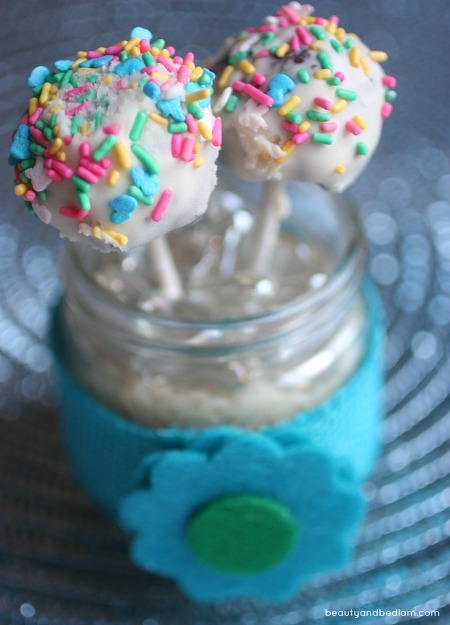 Have you joined the Cake Pop craze yet? What is your favorite combination to make?